Did you know you can hike the Redwoods right here in Orange County? Carbon Canyon Regional Park has a ten-acre grove of Coastal Redwood trees. This grove of redwoods were planted in 1975 with many of the trees standing over 100 feet tall. Not bad being that this is far from their normal growing conditions in Northern California. Carbon Canyon Regional Park is adjacent to Chino Hills State Park, which has 14,000 acres of protected park land (which just happens to have some great mountain biking). In addition to their most popular hike (to see the Orange County Redwoods) Carbon Canyon Regional Park has an interpretive center, picnic areas, restrooms, fishing, playgrounds, walking and hiking trails. To tour the Redwoods at Carbon Canyon you can join OC Parks trained staff for an easy 1.1 mile hike to the redwoods. Use your 5 senses to engage with nature as you stroll to the Redwoods. You will also have an opportunity to learn about native plants along the way. The hike takes place on the first Saturday of each month. The hike begins at the Nature Center located at the east end of the the park. Remember to bring water, sunscreen, hat and hiking shoes. All ages (small children may have to be carried). Reservations are preferred: call (714) 973-3160 or email carboncanyon@ocparks.com. Going to see the Redwoods is one of things on my bucket list but until then there’s an alternative right here in Orange County. Carbon Canyon Regional Park has a ten-acre grove of Coastal Redwood trees. This grove of redwoods were planted in 1975 with many of the trees standing over 100 feet tall. Not bad being that this is far from their normal growing conditions in Northern California. In addition to their most popular hike (to see the Orange County Redwoods) Carbon Canyon Regional Park has an interpretive center, picnic areas, restrooms, fishing, playgrounds, walking and hiking trails. Carbon Canyon Regional Park is adjacent to Chino Hills State Park, which has 14,000 acres of protected park land (which just happens to have some great mountain biking). 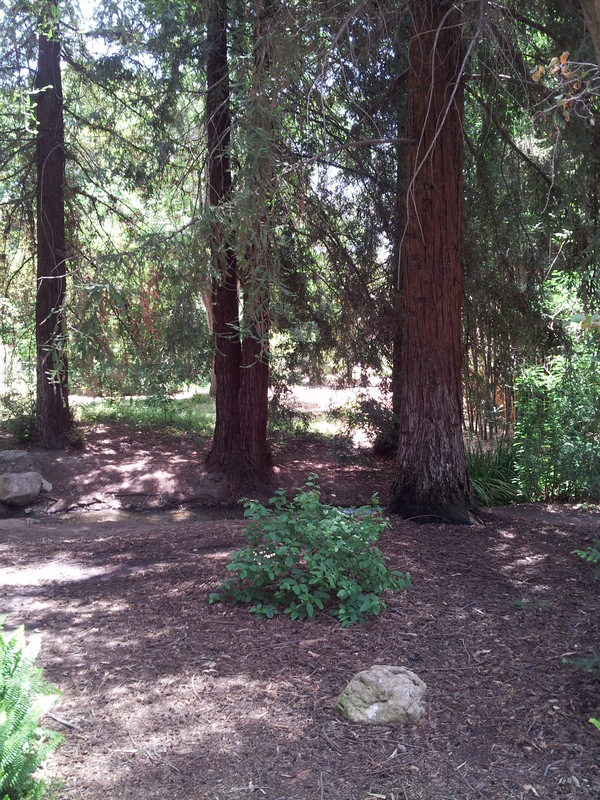 There is a smaller grove of Redwoods in Orange County which is located at UC Irvine. This grove is a result of a former professor’s experiment in tree cloning. The hike begins each Saturday and Sunday morning at 8:30 a.m. from the park’s Nature Center. It runs 8:30am – 10:00am. Don’t forget to visit the Nature Center. Remember to bring water, sunscreen, hat and hiking shoes. All ages (small children may have to be carried). Meet at Nature Center located at east end of park. Cost: Free. Reservations preferred: call (714) 973-3160 or email carboncanyon@ocparks.com. Parking: $5 per vehicle. 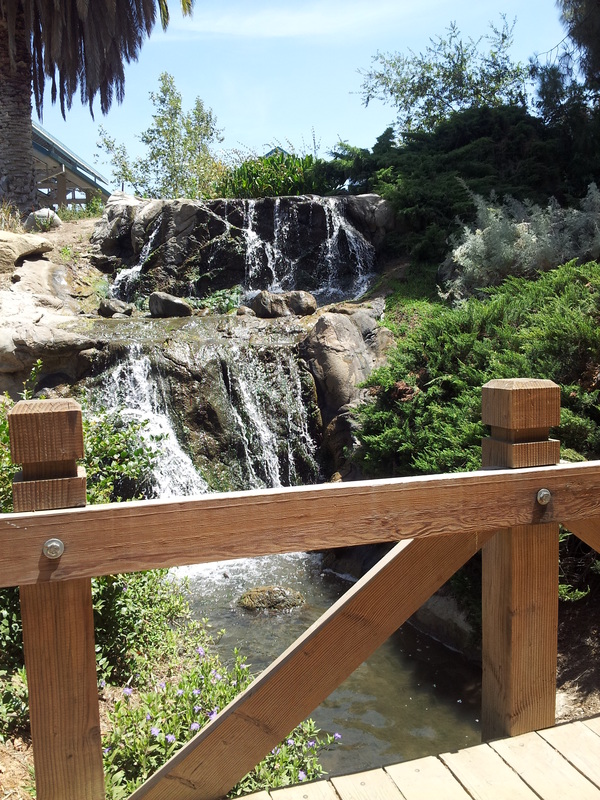 Last Saturday we visited the Fullerton Arboretum, this very tranquil place is located just off the 57 frwy in Fullerton on the Cal State University Fullerton campus. 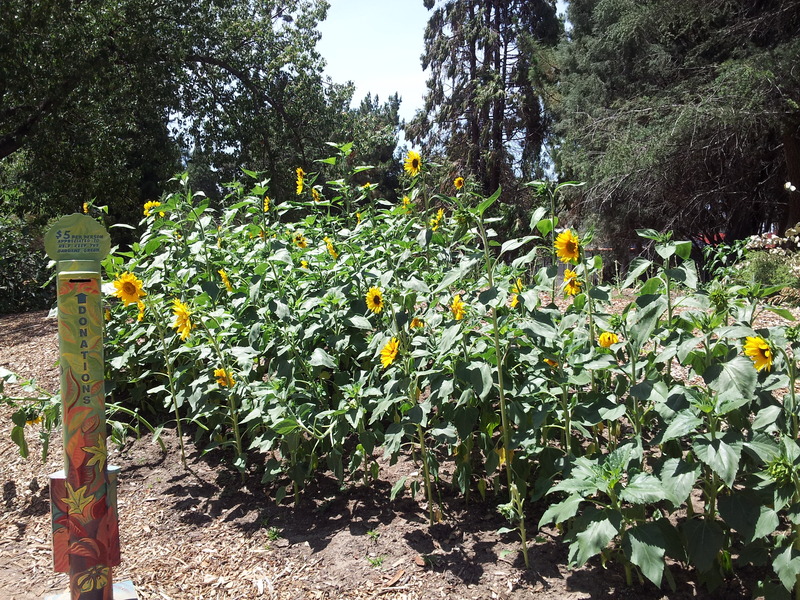 As we walked along the dirt path we were greeted by glorious sunflowers and a waterfall. 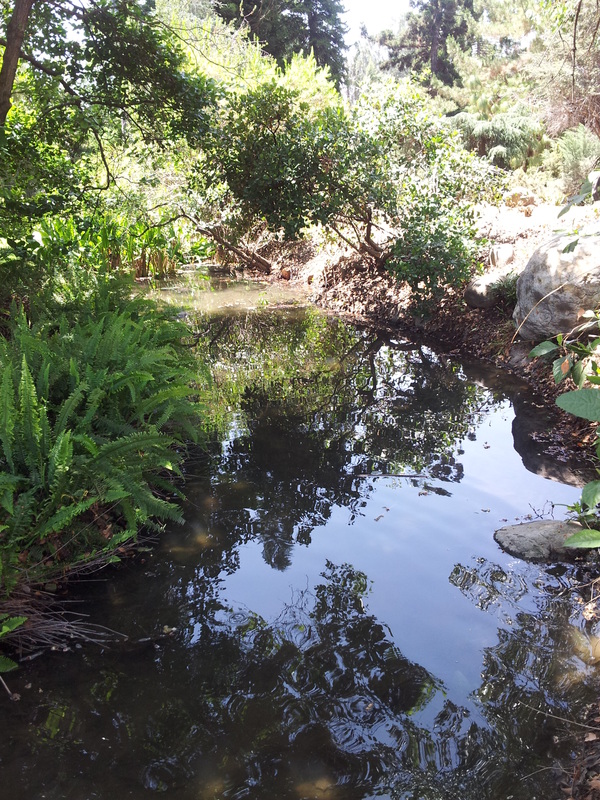 The waterfall leads to a stream that flows throughout one side of the arboretum and into two ponds. 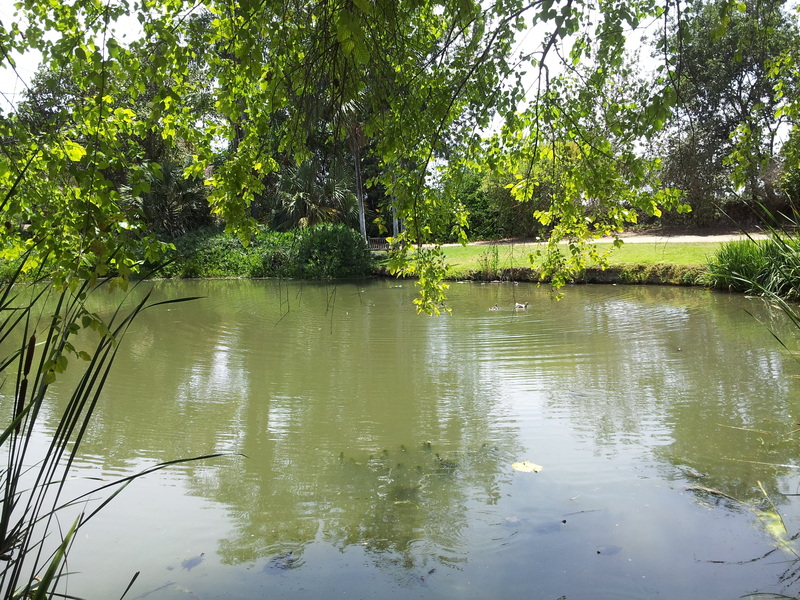 The ponds are hosts to ducks, fish, turtles and cranes. The stream instantly inspired my daughter to draw and write in her journal. 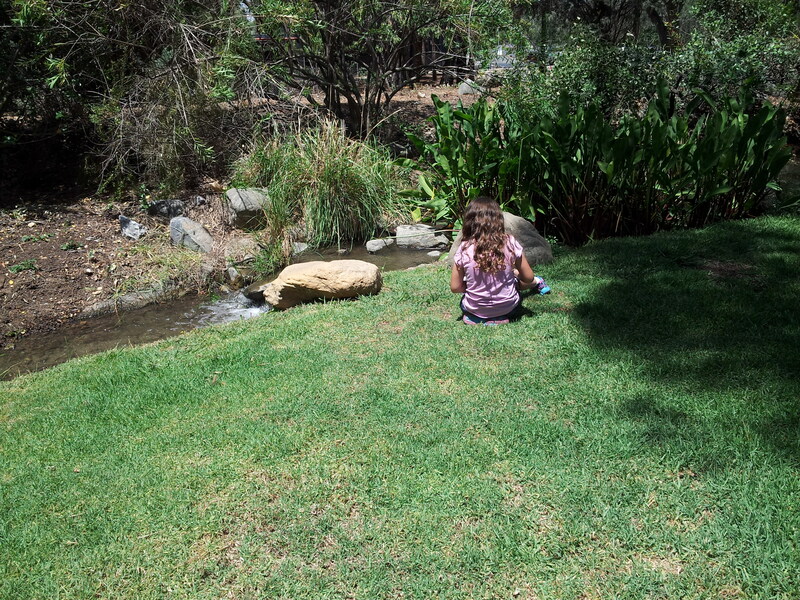 There is a small nature center for the kids (with binoculars for the kids to use during their visit), a fruit orchard, a children’s garden, a community garden, walking trails (one with redwood trees) and a plant store called the “Potting Shed” that sells plants which reflect the Arboretum’s Garden Collections: Cultivated, Desert, Mediterranean, and Woodland. 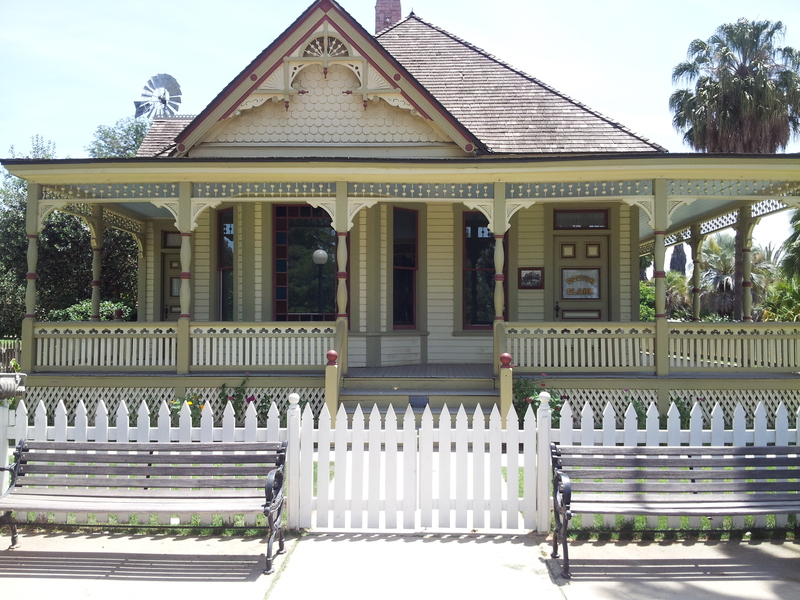 They have guided tours of the Heritage House. 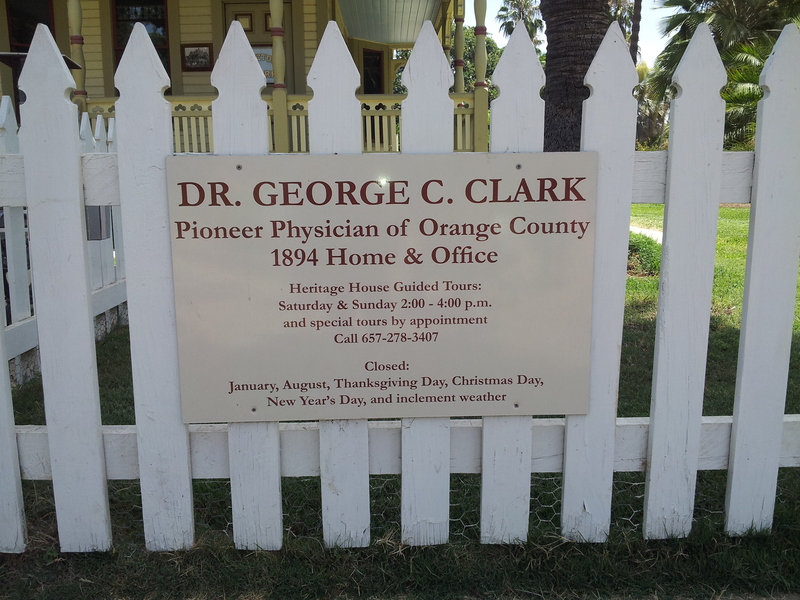 This Eastlake style home was the home of Dr. Clark, one of the most highly regarded individuals in early Fullerton. The home was relocated to the Arboretum in 1972. The interior is fully restored and refurbished with furniture and medical equipment of that era. A suggested donation of $3.00 is encouraged be not required. The Farm Stand is open every Sunday and sells vegetable grown at the arboretum. They offer educational opportunities for adults such as Yoga in the Garden, Composting and an Eating in the Yard Series. They also hold an ongoing children’s series called Bug-Safaris, There are plenty of walking trails and benches to sit and enjoy the views and a quick snack. Bring your water and be advised that picnicking is not allowed inside the Arboretum, there are however picnic tables just before the entrance. Parking is free on a dirt lot. A donation of $5.00 to visit the arboretum is suggested but not required. For a complete list of events check their calendar. In addition to the Family Fun to be had here, places like this are a great addition to your Summer Educational Series. 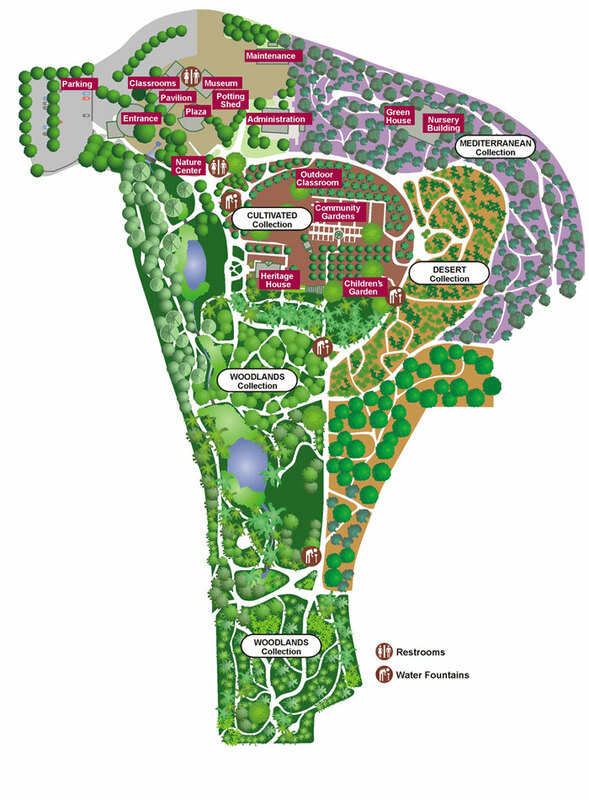 Here’s a list of botanical gardens and arboretums in the United States.